Calorie restriction and fasting are 2 of the hottest areas of research in longevity and age rejuvenation. In fact, you probably know someone who has dabbled in, or who is currently dabbling in, one or the other. These techniques, whether you’re talking about calorie restriction, fasting, or protein restriction, fall under the general umbrella of nutrient restriction. Nutrient restriction without malnutrition has some powerful benefits for health, but the basic premise is that it promotes longevity by slowing down the aging process. The primary strengths of nutrient restriction are that the pathways that it activates are conserved across the animal kingdom and all of the pharmaceutical attempts at age rejuvenation are working through these same pathways. But it’s important to point out that pretty much all the data on nutrient restriction and longevity is done in animal models. Of course, there’s good reason why all of the research is done in animal models. The primary factor is simply that we live too long, so we’d be waiting for quite some time to find out the results. You’d also have to control for a large number of factors that make a high quality experiment with lots of subjects not feasible. Mice are easy to control and live short enough lives that we can see how nutrient restriction affects their health and lifespan pretty easily. Many people like to poo-poo studies in mice as not pertinent to humans, but this is how science works. Identifying the mechanisms behind nutrient restriction in mice is very pertinent to humans as long as that pathway is conserved in humans. These pathways are conserved throughout the animal kingdom and appear to govern processes vital to health and longevity. So let’s dig in to the data and see if the results of nutrient restriction in animal models holds any promise in human health and longevity. I covered epigenetic drift in my last blog that you can check out here. The basic jist of it is that epigenetic drift is a set of changes to the way genes are regulated that occurs with age. These changes can be caused by environmental exposures or random changes that may not be quite so random since they are somewhat predictable. Different animals have different rates of epigenetic drift that correlate to their lifespan. Animals that experience more epigenetic drift annually have shorter lifespans than those that experience less. Therefore, reducing epigenetic drift is an attractive target for promoting longevity. In a recent study looking at mice and rhesus monkeys, calorie restriction was shown to reduce epigenetic drift and this led to a reduction in biological, or epigenetic, age. The results varied based on the species(Mice vs monkeys), amount of calorie restriction(40% vs 30%), and the period of time calorie restriction was practiced(Almost entire lifespan vs 2/3 lifespan)(1). Particularly interesting in this study is the effect on monkeys. Rhesus monkeys, which have a typical lifespan of about 25 years, saw a 7 year reduction in their epigenetic age under 30% calorie restriction when it was started around 10 years of age. This is motivating since there seemed to be significant age reduction when calorie restriction was started in middle age in a fellow primate. The mice saw greater relative improvements when exposed for most of their life. This indicates that calorie restriction may be better when started earlier. It’s important to note that mice should, in theory, respond better to anything that minimizes epigenetic drift since they experience a greater rate of epigenetic drift. In other words, they have more room for improvement. Using a fellow primate provides further evidence that calorie restriction may be useful in extending human health and longevity, but it also illustrates the limitations calorie restriction has on extending human lifespan. Monkeys experience less epigenetic drift than mice and humans experience less epigenetic drift than monkeys. In other words, we have less room for improvement than either animal models. Based off this data, all we could really hope to gain from calorie restriction from a lifespan perspective is maybe a couple of years. If we take the science as it stands, the maximum human lifespan given the technology we have now is around 120 years. This is consistent with what we see in the Blue Zones, areas where there are a significantly larger number of centenarians and a far lower rate of the chronic disease of aging(2). So when we look at these Blue Zones, we are looking at the ideal conditions for human healthspan and longevity. The people already pushing the envelope for human lifespan already practice calorie restriction, so why would we expect to get more out of it? I do believe the data supports the notion that calorie restriction optimizes healthspan, the period of time we can live without disability. This may seem trivial, but it’s important from a needless suffering and cost to society perpsective. Another recent study looked at the effects of calorie restriction on the circadian expression of genes in the liver and stem cells. This study is great because it compared the effects of calorie restriction versus normal diet in young and old mice. 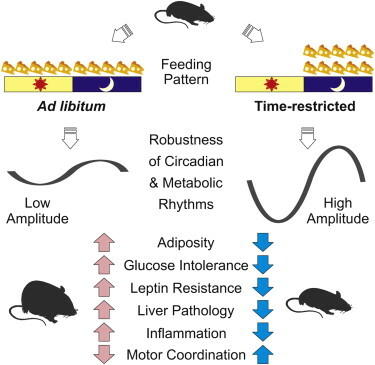 In the stem cell data, the most important finding was that the stem cells of older mice on a normal diet maintain circadian rhythms, they simply change their focus. Rather than focusing on tissue maintenance, they re-shift their focus to coping with stress. Calorie restriction prevented this(3). Another finding was that older mice on a normal diet saw an increase in the circadian expression of genes that regulate stem cell differentiation in epidermal(skin) and skeletal muscle stem cells. This would lead to faster erosion of the stem cell pool in both of these tissues, a common effect and likely contributor to aging. Calorie restriction also prevented this(3). In the liver, young and old mice fed a normal diet saw an increase in circadian expression of genes regulating the inflammatory response when compared to young and old calorie restricted mice. The comparisons were actually pretty striking when you look at circadian expression of genes in the liver of young and old calorie restricted mice. They were essentially carbon copies of one another(4). In fact, old mice fed a calorie restricted diet were more similar in circadian gene expression to young calorie restricted mice than young mice fed a normal diet were. But the really interesting finding involves a process that lost circadian expression in the old mice fed a normal diet: autophagy. Autophagy is the destruction and recycling of damaged cellular components. Old mice fed a normal diet seemingly lost the circadian expression of a large number of genes that regulate autophagy. There was even some loss in the young mice fed a normal diet, but both calorie restricted groups saw similar levels of circadian expression of autophagy related genes. This finding is especially interesting given a recent study in nematode worms that found blocking defective autophagy in old worms extends lifespan(5). We’ve known for quite some time that autophagy is defective in older animals. But the process is so important for healthy cells that the assumption was that some autophagy is better than none. This recent study indicates that this isn’t the case, at least in lower organisms like the nematode worm. An interesting sidebar here is that we know older animals are more susceptible to circadian disruption(6). It would be interesting to find out if the detrimental effects of autophagy with age are related to this fact. Rather than being a loss of autophagy related processes, perhaps it’s a mis-timing of the same. The great thing about this is that both calorie restriction and proper exposure to environmental factors that set circadian rhythms, called zeitgebers, can rescue circadian disruption. It’s not that our circadian clocks are broken, it’s that aging causes a greater reliance on zeitgebers to set the time. More on this here, here and here. Is calorie restriction necessary for these effects? Being hungry isn’t fun. But I think it’s fair to say that there’s a fairly consistent finding in most of the studies done in longevity in all animals, humans included. This finding, simply put, is that chronic caloric excess isn’t compatible with a long and healthy life, save for the rare individual with exceptional genetic make up. There’s very good reason for this: circadian rhythms regulate the optimal time to schedule repair processes and a large part of this is dictated by the feeding/fasting cycle. People under chronic caloric excess never have time to schedule repairs, especially as they get older. What these people are left with is damaged cells and a reduced ability to fix them. As we grow older, our susceptibility to circadian disruption increases, so we see a progressive acceleration of this damage. As the study looking at the effects of circadian gene expression in the liver showed, much of this can be rescued with calorie restriction. The problem with this is that I have trouble seeing most people practicing 30% calorie restriction for any appreciable amount of time unless it’s forced upon them. This is consistent with the increased rates of obesity and overweight in humans living in The West. There are a couple of other options that provide similar benefits to calorie restriction. Maintaining a higher carbohydrate to protein ratio(5% calories from protein) was shown to lead to the same metabolic improvements as 40% calorie restriction in mice(7). It’s interesting to note that the mice fed the low protein/high carbohydrate diet had unrestricted access to food and consumed double the calories of the calorie restricted mice. There are some drawbacks to this approach. Over time, mice have been shown to become obese eating this type of diet, which is never a good thing. Furthermore, the quality of dietary carbohydrate is also important, so you won’t be scarfing down bread and brownies and seeing the same results. All in all, this approach may be just as cumbersome as restricting calories. In my opinion, and this bears itself out in the literature, time-restricted feeding is far and away the best approach one can undertake and hope to achieve similar benefits as calorie restriction. In fact, any of the data on fasting or calorie restriction is inherently also data on time-restricted feeding to some extent. They’re not waking mice up in the middle of the night and feeding them. Data in mice shows time-restricted feeding(TRF) without reducing calorie intake prevents the metabolic dysfunction associated with aging in mice eating a low quality diet(8). The same type of diet that normally induces type 2 diabetes in mice. These effects were mediated through improvements in mTOR, AMPK, and CREB pathway signaling. Greater liver function, better glucose and leptin sensitivity, lower inflammation, and decreased body fat…Sounds a lot like calorie restriction. In my personal opinion, time-restricted feeding is by far the easiest eating regimen I’ve ever undertaken. I eat what I want, drink craft beer on the weekends, and don’t feel like I’m missing out on anything. My hemoglobin A1c is 4.9% and I feel pretty good. I’ve been personally doing TRF properly for almost a year, and the most interesting thing about it is that I’ve lost 10 lbs. Whether this is because I’m eating fewer calories, or perhaps burning more, is irrelevant to me. It’s really not that difficult and I don’t have to count my calories. I’m also not a slave to limiting a specific macronutrient. Granted, I eat a pretty high quality diet with lots of vegetables and nutrient dense foods. But I’ve been doing that for more than 5 years now so my newfound weight loss likely has little to do with a change in food quality. I also practiced what i thought was TRF for a couple of years prior, but becoming more familiar with the protocol led me to realize I was doing it all wrong. Moving forward I hope to document my experiences with TRF, specifically through the lens of how it impacts the aging process. I took my first DNA methylation test by Epimorphy and am awaiting the results. I’m not sure what to expect, I probably consume too much craft beer and unhealthy food on the weekends to yield a huge difference. This test should give me direction, Stay tuned! Very interesting! I have been practicing about 20% calorie restriction for about a year and a half now. In relation to a ketogenic diet, it is not too hard because I don’t really get hungry. But it would be interesting to learn more about time restricted feeding instead. Is that the same as intermittent fasting? I have tried that, but my digestion seems to do better with three small meals than two larger ones. 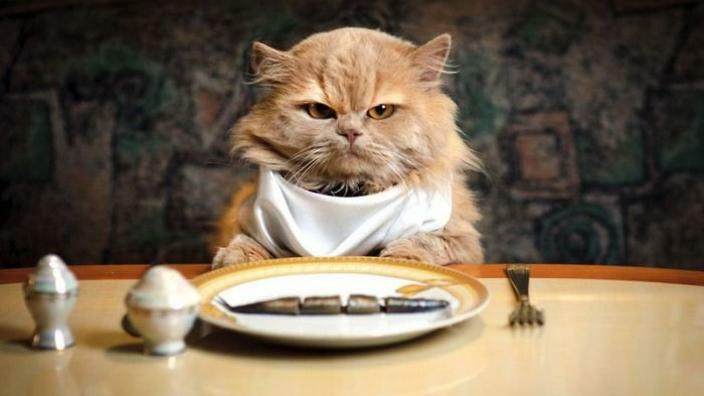 Some people consider TRF to be a form of intermittent fasting. Basically, you just restrict feedings to a specific period of the day, say 10am-7pm. You can eat as many meals as you want, but the belief is that 2-3 seems to be better than grazing during the feeding period.